For only $20 monthly you can give a poor child the chance to have a future. 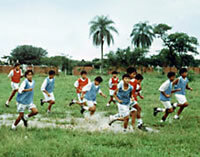 Through soccer, the Tahuichi children have the chance to achieve success whether they decide to turn professional or not. Tahuichi's principal objective is to promote and stimulate youth soccer as healthy recreation and preventive action against such society risks as drugs and alcoholism. 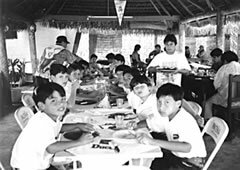 Since 1978, the Tahuichi Academy has been able to offer recreational and advance soccer courses to more than 150,000 children. Approximately 90% have participated cost free because they come from very poor families. Tahuichi offers opportunities to those talented players, training them to achieve professional level, both nationally and internationally. More than 200 Tahuichi players have played in the Bolivian Professional League. Over 230 players compete in the various National Select Teams and 30 players have played internationally. Tahuichi also offers academic alternatives to its players through university and high school sport scholarships. Tahuichi has contributed to the graduation of 23 players in the USA, Cuba and Russia. Presently 32 players are studying in different universities and high schools. These young athletes learn and obtain a different vision of life built with a positive mentality and high moral and social standards. On a daily basis, Tahuichi provides complimentary health, psychological and educational services to the children. Those who participate in Select Teams receive supplemental nutritional support. The vast majority of the children come from very poor backgrounds. Many live on the streets. Many are abused. But once on the soccer field, an extraordinary transformation takes place. Through soccer, all the children experience a social integration that unifies them, gives them purpose and helps them to become better citizens of the future. In order to maintain this high level of social commitment, and to continue growing in excellence, we need the collaboration of people like you as well as the helping hand of companies with social sensitivity. In order to keep helping, stimulating and promoting new soccer talent, with the goal of giving each child the opportunity of being happy and whole through soccer, we are asking you to contribute with one or more Tahuichi Scholarships. The children can be selected by you or picked out of the students who attend Tahuichi. If you desire, these children will keep you informed of their achievements in Tahuichi through correspondence. The value of a Tahuichi Scholarship is $20 per month per child and the recommended age would be between 3 and 14 years old. For tax purposes, you will be provided with a receipt.